Abdelhamid, T. and Everett, J. 2000. Identifying root causes of construction accidents. Journal of Construction Engineering and Management, 126, 52. AFP. 2014. Saudi to continue ‘massive’ spending despite oil price fall [Online]. Available: http://www.dailymail.co.uk/wires/afp/article-2877458/Saudi-continue-massive-spending-despite-oil-price-fall.html [Accessed 14-1-2015]. Al-Arrayed, A. and Hamza, A. 1995. Occupational injuries in Bahrain. Occupational Medicine, 45, 231. Al-Awsat, A. 2008. Saudi Arabia: Suicide Rate on the Rise [Online]. Available: http://www.aawsat.net/2008/02/article55259861 [Accessed 3-4-2013]. Al-Ibrahim, B. 2012. Why Are Saudis Killing Themselves? [Online]. Available: http://english.al-akhbar.com/node/6675 [Accessed 14-12-2013]. Al-Kaabi, N. and Hadipriono, F. 2003. Construction safety performance in the United Arab Emirates. Civil Engineering and Environmental Systems, 20, 197-212. Chang, F.-L., Sun, Y.-M., Chuang, K.-H. and Hsu, D.-J. 2009. Work fatigue and physiological symptoms in different occupations of high-elevation construction workers. Applied ergonomics, 40, 591-596. Choudhry, R. and Fang, D. 2008. Why operatives engage in unsafe work behavior: Investigating factors on construction sites. Safety Science, 46, 566-584. Cigularov, K., Chen, P. and Rosecrance, J. 2010. The effects of error management climate and safety communication on safety: A multi-level study. Accident Analysis and Prevention. Easterby-Smith, M., Thorpe, R., Jackson, P. and Lowe, A. 2008. Management research, Sage. Goldenhar, L., Williams, L. J. and G. Swanson, N. 2003. Modelling relationships between job stressors and injury and near-miss outcomes for construction labourers. Work and Stress, 17, 218-240. Goldenhar, L. M., Swanson, N. G., Hurrell Jr, J. J., Ruder, A. and Deddens, J. 1998. Stressors and adverse outcomes for female construction workers. Journal of Occupational Health Psychology, 3, 19. GOSI. 2013. Employment injuries [Online]. Available: www.gosi.gov.sa/ [Accessed 15-01-2013]. Hohnen, P. and Hasle, P. 2011. Making work environment auditable–A ‘critical case’study of certified occupational health and safety management systems in Denmark. Safety Science, 49, 1022-1029. Ibrahim, A., Roy, M., Ahmed, Z. and Imtiaz, G. 2010. Analyzing the dynamics of the global construction industry: past, present and future. Benchmarking: An International Journal, 17, 232-252. Jannadi, M. and Al-Sudairi, A. 1995. Safety management in the construction industry in Saudi Arabia. Building Research and Information, 23, 60-63. Jannadi, M. and Assaf, S. 1998. Safety assessment in the built environment of Saudi Arabia. Safety Science, 29, 15-24. Jannadi, O. 1995. Impact of human relations on the safety of construction workers. International Journal of Project Management, 13, 383-386. Jannadi, O. 2008. Risks associated with trenching works in Saudi Arabia. Building and Environment, 43, 776-781. Jannadi, O. and Bu-Khamsin, M. 2002. Safety factors considered by industrial contractors in Saudi Arabia. Building and Environment, 37, 539-547. Kartam, N., Flood, I. and Koushki, P. 2000. Construction safety in Kuwait: issues, procedures, problems, and recommendations. Safety Science, 36, 163-184. Kheni, N., Dainty, A. R. J. and Gibb, A. G. F. 2007. Influence of political and socio-cultural environments on health and safety management within SMEs: a Ghana case study. In: BOYD, D. (ed.) Proceedings of the 23 Annual ARCOM Conference. 23 Annual ARCOM Conference. Kortum, E., Leka, S. and Cox, T. 2010. Psychosocial risks and work-related stress in developing countries: health impact, priorities, barriers and solutions. International Journal of Occupational Medicine and Environmental Health, 23, 225-238. Larsson, S., Pousette, A. and Törner, M. 2008. Psychological climate and safety in the construction industry-mediated influence on safety behaviour. Safety Science, 46, 405-412. Leung, M.-y., Chan, Y.-S. and Yuen, K.-W. 2010. Impacts of stressors and stress on the injury incidents of construction workers in Hong Kong. Journal of Construction Engineering and Management, 136, 1093-1103. Marianne, T. 2011. The “social-physiology” of safety. An integrative approach to understanding organisational psychological mechanisms behind safety performance. Safety Science, 49, 1262-1269. Mohamed, S., Ali, T. H. and Tam, W. 2009. National culture and safe work behaviour of construction workers in Pakistan. Safety Science, 47, 29-35. Murie, F. 2007. Building safety—an international perspective. International journal of occupational and environmental health, 13, 5-11. Nasab, H. S., Tavakoli, R., Ghofranipour, F., Kazemnejad, A. and Khavanin, A. 2009. Evaluation of Knowledge, Attitude and Behavior of Workers towards Occupational Health and Safety. Iranian Journal of Public Health, 38. Parkin, A. B., Tutesigensi, A. and Büyükalp, A. I. Motivation among construction workers in Turkey. Proceedings 25th Annual Conference, 2009. ARCOM. Peebles, G. 2013. The abuse of migrant workers in Saudi Arabia [Online]. Available: http://www.redressonline.com/2013/12/the-abuse-of-migrant- workers-in-saudi-arabia/[Accessed 7-6-2014]. Perazzo, B. 2013. Nightmare in Saudi Arabia: The Plight of Foreign Migrant Workers [Online]. Available: http://www.thedailybeast.com/ articles/2013/01/14/nightmare-in-saudi-arabia-the-plight-of-foreign-migrant-workers.html [Accessed 10-12-2013. SAGIA. 2011. Saudi Arabia General Investment Authority [Online]. Available: www.sagia.gov.sa [Accessed 1-5-2011]. Siu, O., Phillips, D. and Leung, T. 2004. Safety climate and safety performance among construction workers in Hong Kong:: The role of psychological strains as mediators. Accident Analysis and Prevention, 36, 359-366. Törner, M. and Pousette, A. 2009. Safety in construction-a comprehensive description of the characteristics of high safety standards in construction work, from the combined perspective of supervisors and experienced workers. Journal of Safety Research. USSABC 2009. The Construction Sector in the Kingdom of Saudi Arabia. The U.S.-Saudi Arabian Business Council (USSABC). Agudelo-Suárez, A.A., Ronda-Pérez, E., Gil-González, D., Vives-Cases, C., García, A.M., Ruiz-Frutos, C., Felt, E. and Benavides, F.G. 2011. The effect of perceived discrimination on the health of immigrant workers in Spain. BMC Public Health, 11(1), 652. Allegrante, J. P., Hanson, D. W., Sleet, D. A. and Marks, R. 2010. Ecological approaches to the prevention of unintentional injuries. Italian Journal of Public Health, 7, 24-31. Arabnews. 2014. Expats’ stay in KSA might be restricted [Online]. Available: http://www.arabnews.com/news/448234. Arboleda, C. A. and Abraham, D. M. 2004. Fatalities in Trenching Operations—Analysis Using Models of Accident Causation. Journal of Construction Engineering and Management, 130, 273. Bakker, A. B. and Demerouti, E. 2007. “The job demands-resources model: State of the art”, Journal of managerial psychology, vol. 22, no.3, pp. 309-328. Baron-Epel, O. and Ivancovsky, M. 2015. A socio-ecological model for unintentional injuries in minorities: a case study of Arab Israel children. International Journal of Injury Control and Safety Promotion, 22(1), 48-56. Bernaards, C., Jans, M., Van den Heuvel, S., Hendriksen, I., Houtman, I. and Bongers, P. 2006. Can strenuous leisure time physical activity prevent psychological complaints in a working population? Occupational and environmental medicine, 63, 10-16. Bertone, S. and Griffin, G. 1995. Immigrant female workers and Australian trade unions. Relations Industrielles/Industrial Relations, 50, 117-146. Booth, S. L., Sallis, J. F., Ritenbaugh, C., Hill, J. O., Birch, L. L., Frank, L. D., Glanz, K., Himmelgreen, D. A., Mudd, M. and Popkin, B. M. 2001. Environmental and societal factors affect food choice and physical activity: rationale, influences, and leverage points. Nutrition Reviews, 59, S21-S36. Braun, V. E. 2001. Intercultural communication and psychological health of Turkish workers in an American-German workplace in Germany. Bright, J. 2001 In The NOHSC Symposium on the OHS Implications of Stress. Centre for Addictions Research of BC. 2011. Promoting a positive mental health through a socio-ecological approach. URL: http://www. heretohelp.bc.ca/factsheet/promoting-positive-mental-health-through-a-socio-ecological-approach. [22 Nov. 2016]. Cooper, C. L., and Marshall, J. 1976. Occupational sources of stress: A review of the literature relating to coronary heart disease and mental ill health. In C. L. Cooper (Ed. ), From Stress to Wellbeing (Vol. 1). UK: Palgrave Macmillan. Cox, T, Griffiths, A and Rial-González, E. 2000. Research on work-related stress: European agency for safety and health at work. Research on work-related stress: European Agency for Safety and Health at Work. CSA. 2013. Psychological Health and Safety in the Workplace–Prevention, Promotion, and Guidance to Staged Implementation. Canada: Canadian Standards Association. Davin, D. 2000. Migrants and the media: Concerns about rural migration in the Chinese press. Rural Labor Flows in China, eds. Loraine A. West and Yaohui Zhao, Institute of East Asian Studies, University of California, Berkeley. De Jonge, J., and Dormann, C. 2003. The DISC model: Demand-induced strain compensation mechanisms in job stress. In M. F. Dollard, A. H. Winefield and H. R. Winefield (Eds. ), Occupational stress in the service professions (pp. 43-74). London: Taylor & Francis. Dekker, S. W. and Schaufeli, W. B. 1995. The effects of job insecurity on psychological health and withdrawal: A longitudinal study. Australian psychologist, 30, 57-63. Demerouti, E., Bakker, A. B., Nachreiner, F. and Schaufeli, W. B. 2001. “The job demands-resources model of burnout”, Journal of Applied psychology, 86(3), 499. Dong, X. 2005. Long workhours, work scheduling and work-related injuries among construction workers in the United States. Scandinavian journal of work, environment and health, 329-335. Drummond, J. 2006. Business risk: a two-tier environment. Available: http://www.riskadvisory.net/uploads/File/TRAG%20newsletter/Issue%2014%20-%20SAUDI%20ARABIA%20Business%20Opportunities%20and%20Risks.pdf [Accessed 9-4-2013]. Dzewaltowski, D. A., Estabrooks, P. A. and Johnston, J. A. 2002. Healthy youth places promoting nutrition and physical activity. Health Education Research, 17, 541. Fang, M. L. and Goldner, E. 2011. Transitioning into the Canadian workplace: Challenges of immigrants and its effect on mental health. Canadian Journal of Humanities and Social Sciences, 2, 93-102. Ganster, D.C. 2002. ‘The stressful workplace: Mental and physical health and the problem of prevention’, In A. Maney and J. Ramos (Eds. ), Socioeconomic conditions, stress and mental disorders: Toward a new synthesis of research and public policy, Mental Health Statistical Improvement Program, National Institute of Mental Health, Washington. Glasscock, D. J., Rasmussen, K., Carstensen, O. and Hansen, O. N. 2006. Psychosocial factors and safety behaviour as predictors of accidental work injuries in farming. Work and Stress, 20, 173-189. Griffin, J. and Soskolne, V. 2003. Psychological distress among Thai migrant workers in Israel. Social Science and Medicine, 57, 769-774. Harcourt, M., Lam, H., Harcourt, S. and Flynn, M. 2008. Discrimination in hiring against immigrants and ethnic minorities: the effect of unionization. The International Journal of Human Resource Management, 19, 98-115. Headey, B. 2006. Subjective well-being: Revisions to dynamic equilibrium theory using national panel data and panel regression methods. Social Indicators Research, 79(3), 369-403. Headey, B., and Wearing, A. 1989. Personality, life events, and subjective well-being: toward a dynamic equilibrium model. Journal of personality and social psychology, 57(4), 731.
International Trade Union Confederation (ITUC). 2014. The case against Qatar. URL: https://www.ituc-csi.org/IMG/pdf/the_case_against_ qatar_en_web170314.pdf. [16 Nov. 2016]. Ishiyama, F. I. and Westwood, M. J. 1992. Enhancing Client‐Validating Communication: Helping Discouraged Clients in Cross‐Cultural Adjustment. Journal of Multicultural Counseling and Development, 20, 50-63. Jacobs, P. A., Tytherleigh, M. Y., Webb, C. and Cooper, C. L. 2007. “Predictors of work performance among higher education employees: An examination using the ASSET Model of Stress”, International Journal of Stress Management, 14(2), 199. Jaffe, J., Segal, J and Dumke, L.F. 2005. Emotional and Psychological trauma:causes, symptoms, effects and treatment. URL: http://www. dhhs.tas.gov.au/__data/assets/pdf_file/0004/38434/Trauma.pdf. [02 Sep. 2015]. Johnson, S., Cooper, C., Cartwright, S., Donald, I., Taylor, P. and Millet, C. 2005. “The experience of work‐related stress across occupations”, Journal of Managerial Psychology, 20(2), 178-187. Karesek, R and Theorell, T. 1990. Healthy work. Stress, productivity and the reconstruction of work life. New York: John Wiley & Sons. Kazaz, A. and Ulubeyli, S. 2007. 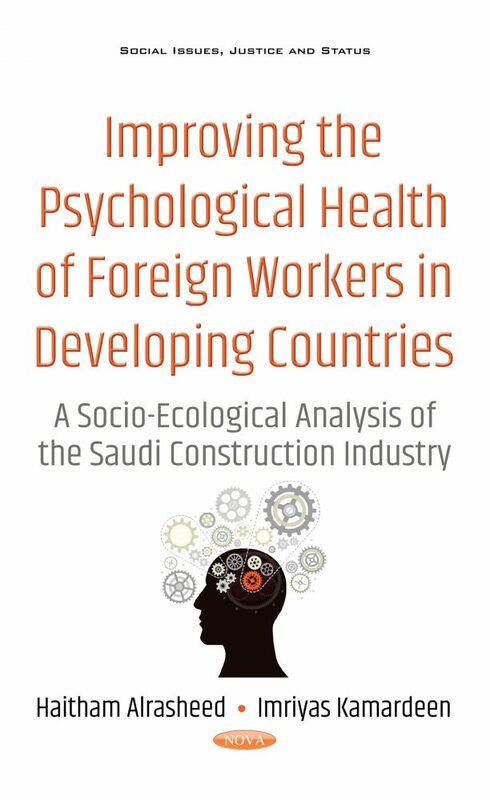 Drivers of productivity among construction workers: A study in a developing country. Building and Environment, 42, pp. 2132-2140. Law, R., Dollard, M. F., Tuckey, M. R. and Dormann, C. 2011. Psychosocial safety climate as a lead indicator of workplace bullying and harassment, job resources, psychological health and employee engagement. Accident Analysis and Prevention, 43, 1782-1793. Lazarus, R. S., and Folkman, S. 1984. Stress, appraisal, and coping. New York: Springer Publishing Company. Loosemore, M., Phua, F., Dunn, K. and Ozguc, U. 2010. Operatives’ experiences of cultural diversity on Australian construction sites. Construction Management and Economics, 28, 177-188. Mark, G. M., and Smith, A. P. 2008. Stress models: A review and suggested new direction. Occupational health psychology, 3, 111-144. Mikkelsen, E. and Einarsen, S. 2002. Relationships between exposure to bullying at work and psychological and psychosomatic health complaints: the role of state negative affectivity and generalized self–efficacy. Scandinavian journal of psychology, 43, 397-405. Miller, T. A., and McCool, S. F. 2003. Coping with Stress in Outdoor Recreational Settings: An Application of Transactional Stress Theory. Leisure Sciences, 25(2-3), 257-275. Moran, M., Baron-Epel, O. and Assi, N. 2010. Causes of road accidents as perceived by Arabs in Israel: a qualitative study. Transportation Research Part F, 13, 377-387. Muchinsky, P.M. 2006. Psychology Applied to Work. 8th Ed. USA: Thomson Wadsworth. Nesdale, D. and Mak, A. S. 2003. Ethnic identification, self-esteem and immigrant psychological health. International Journal of Intercultural Relations, 27, 23-40. Nieuwenhuijsen, K., Bruinvels, D. and Frings-Dresen, M. 2010. Psychosocial work environment and stress-related disorders, a systematic review. Occupational Medicine, 60(4), 277-286. Pottie, K., Ng, E., Spitzer, D., Mohammed, A. and Glazier, R. 2008. Language proficiency, gender and self-reported health: an analysis of the first two waves of the longitudinal survey of immigrants to Canada. Can J Public Health, 99, 505-10. Productivity Commission, P. 2010. Performance benchmarking of Australian business regulation: Occupational health and safety. Research Report. Canberra. Safe Work Australia. 2013. Media release: Mental stress costs Australian businesses more than $10 billion per year. Retrieved from: http://www. safeworkaustralia.gov.au/sites/SWA/media-events/media-releases/ Documents/2013%20Media%20Releases/MR08042013-Mental-Stress-Cost-Australian-Businesses.pdf. (Accessed 17 May 2015). Sallis, J. F., Conway, T. L., Prochaska, J. J., McKenzie, T. L., Marshall, S. J. and Brown, M. 2001. The association of school environments with youth physical activity. American Journal of Public Health, 91, 618. Santos, A., Ramos, H.M., Ramasamy, G. and Fernandes, C. 2015. Musculoskeletal pain among migrant workers in the Malaysian manufacturing industry: the impact of the physical environment, workload and work patterns. Social Sciences and Humanities, 23(2), 315-324. Siegrist, J. 2009. ‘Job control and reward: effects on well being’, In (Eds, Cartwright, S. and Cooper, C. L.), The Oxford handbook of organizational well-being Oxford University Press, Oxford, 109-132. Siegrist, J., 1996. Adverse health effects of high-effort/low reward conditions. Journal of Occupational Health Psychology 1, 27-41. Simich, L. Hamilton, H. and Baya, B. K. 2006. Mental distress, economic hardship and expectations of life in Canada among Sudanese newcomers. Transcultural Psychiatry, 43, 418-444. Sonmez, S., Apostolopoulos, Y., Tran, D. and Rentrope, S. 2011. Human rights and health disparities for migrant workers in the UAE. Health and Human Rights: An International Journal, 13. Stokols, D., Pelletier, K. R. and Fielding, J. E. 1996. The ecology of work and health: research and policy directions for the promotion of employee health. Health Education and Behavior, 23, 137. SW. 2011. Thousands of workers strike in Saudi Arabia [Online]. Socialist Worker. Available: http://www.socialistworker.co.uk/art.php?id= 24025 [Accessed 14-8-2011. Tytherleigh, M., Webb, C., Cooper, C. and Ricketts, C. 2005. “Occupational stress in UK higher education institutions: A comparative study of all staff categories”, Higher Education Research and Development, 24(1), 41-61. Vakola, M. and Nikolaou, I. 2005. “Attitudes towards organizational change: What is the role of employees’ stress and commitment?”, Employee relations, 27(2), 160-174. Van Amelsvoort, L. G., Jansen, N. W., Swaen, G. M., Van Den Brandt, P. A. and Kant, I. 2004. Direction of shift rotation among three-shift workers in relation to psychological health and work-family conflict. Scandinavian journal of work, environment and health, 149-156. Van Der Hulst, M. and Geurts, S. 2001. Associations between overtime and psychological health in high and low reward jobs. Work and Stress, 15, 227-240. Wald, J. and Taylor, S. 2009. Work impairment and disability in posttraumatic stress disorder: A review and recommendations for psychological injury research and practice. Psychological Injury and Law, 2(3), 254-262. Walen, H. R. and Lachman, M. E. 2000. Social support and strain from partner, family, and friends: Costs and benefits for men and women in adulthood. Journal of Social and Personal Relationships, 17, 5-30. Warr, P. 1987. Work, unemployment, and mental health: Oxford University Press. Wong, D.F.K., He, X., Leung, G., Lau, Y. and Chang, Y. 2008. Mental health of migrant workers in China: prevalence and correlates. Social Psychiatry and Psychiatric Epidemiology, 43(6), 483-9. Wong, K., Fu, D., Li, C. Y. and Song, H. X. 2007. Rural migrant workers in urban China: living a marginalised life. International Journal of Social Welfare, 16, 32-40. Avis, M. 1995. Valid arguments? A consideration of the concept of validity in establishing the credibility of research findings. Journal of Advanced Nursing, 22, 1203-1209. Bartlett, J., Kotrlik, J. and Higgins, C. 2001. Organizational research: Determining appropriate sample size in survey research appropriate sample size in survey research. Information technology, learning, and performance journal, 19, 43. Cochran, W. G. 1977. Sampling techniques, (3rd ed. ), John Wiley & Sons, New York. College, B. 2008. Deductive, Inductive and Abductive Reasoning [Online]. Available: https://www.butte.edu/departments/cas/tipsheets/thinking/reasoning.html [Accessed 5-1-2015. Crossman, A. 2011. Deductive Reasoning Versus Inductive Reasoning [Online]. Available: http://sociology.about.com/od/Research/a/ Deductive-Reasoning-Versus-Inductive-Reasoning.htm [Accessed 8-1-2015. Dawson, C. 2002. Practical research methods: a user-friendly guide to mastering research techniques and projects, How To Books Ltd.
Efron, S. E. and Ravid, R. 2013. Action research in education: A practical guide, Guilford Press. Feldman, M. S., Sköldberg, K., Brown, R. N. and Horner, D. 2004. Making sense of stories: A rhetorical approach to narrative analysis. Journal of public administration research and theory, 14, 147-170. Fellows, R. F. and Liu, A. M. 2009. Research methods for construction, John Wiley & Sons. Frechtling, J. and Sharp, L. 1997. User-friendly handbook for mixed method evaluations, DIANE Publishing. Given, L. 2008. The Sage encyclopedia of qualitative research methods, Sage Publications, Inc.
Hennink, M., Hutter, I. and Bailey, A. 2011. Qualitative research methods, Sage. Hole, G. 2014. Kruskal-Wallis handout [Online]. Graham Hole Research Skills. Available: http://www.sussex.ac.uk/Users/grahamh/RM1web/ Kruskal-Wallis%20Handoout2011.pdf [Accessed 1-1-2015]. Israel, G. 2012. Determining sample size (PEOD6). US Department of Agriculture, Cooperative Extension Service, University of Florida, Institute of Food and Agricultural Sciences. Johnson, R., Onwuegbuzie, A. and Turner, L. 2007. Toward a definition of mixed methods research. Journal of Mixed Methods Research, 1, 112. Jupp, V. 2006. The Sage dictionary of social research methods, Sage Publications Ltd.
Kaplan, J. 2014. Stratified Random Sampling [Online]. Available: http://betterevaluation.org/evaluation-options/stratifiedrandom [Accessed 28-2-2015]. Kothari, C. 2002. Research Methodology: Methods and Techniques. Wishwa Prakashan. New Delhi, India. Mack, N., Woodsong, C., Macqueen, K., Guest, G. and Namey, E. 2005. Qualitative research methods: A data collector’s field guide. Family Health International, 00-95. Marczyk, G., Dematteo, D. and Festinger, D. 2005. Essentials of research design and methodology. Mason, M. Sample size and saturation in PhD studies using qualitative interviews. Forum Qualitative Sozialforschung/Forum: Qualitative Social Research, 2010. Noy, C. 2008. Sampling knowledge: The hermeneutics of snowball sampling in qualitative research. International Journal of social research methodology, 11, 327-344. Opler, M. E. 1945. Themes as dynamic forces in culture. American journal of sociology, 198-206. Porta, D. and Keating, M. 2008. Approaches and Methodologies in the Social Sciences: Pluralist Perspective, Cambridge, Cambridge University Press. Rose, S., Spinks, N. and Canhoto, A. I. 2015. Management Research: Applying the Principles, Routledge. Ryan, G. W. and Bernard, H. R. 2003. Techniques to identify themes. Field methods, 15, 85-109. Ryan, S. 2009. Chapter 5 Formulating the research design [Online]. Available: http://www.slidefinder.net/c/chapter-five/32223206 [Accessed 20-02-2015]. Saunders, M., Lewis, P. and Thornhill, A. 2009. Research methods for business students, 5th ed., Harlow: FT Prentice Hall. Stutely, M. 2003. Numbers guide: The essentials of business numeracy, London: Bloomberg Press. Tan, W. 2007. Practical research methods, Prentice Hall. Tashakkori, A. and Creswell, J. W. 2007. Editorial: The new era of mixed methods. Journal of Mixed Methods Research, 1, 3-7. UOA. 2012. About thematic analysis [Online]. The University of Auckland. Available: http://www.psych.auckland.ac.nz/en/about/our-research/research-groups/thematic-analysis/about-thematic-analysis.html [Accessed 25-2-2015]. Van Hemel, S. B., Macmillan, J. and Zacharias, G. L. 2008. Behavioral Modeling and Simulation: From Individuals to Societies, National Academies Press. Antonio, R. L. and Villa, K. d. 2014. Jobless Filipinos hit 12.1M [Online]. Available: http://newsinfo.inquirer.net/576322/ph-unemployment-worsens-sws-survey-shows [Accessed 2-3-2015]. Factbook, C. 2013. The world factbook [Online]. Available: https://www. cia.gov/library/publications/the-world-factbook/fields/2103.html [Accessed 4-3-2015]. Garvey, P. R. and Lansdowne, Z. F. 1998. Risk matrix: an approach for identifying, assessing, and ranking program risks. Air Force Journal of Logistics, 22, 18-21. Guzi, M. 2014. Estimating a Living Wage Globally. Living out of stereotypes, 59. Mellahi, K. 2007. The effect of regulations on HRM: private sector firms in Saudi Arabia. The International Journal of Human Resource Management, 18, 85-99. Ratha, D and Shaw, W. 2007. South-South Migration and Remittances. World Bank Working Paper No. 102. Washington, DC: World Bank. https://openknowledge.worldbank.org/handle/10986/6733 License: CC BY 3.0 IGO. [Accessed 18-3-2017]SAGIA. 2005. LABOR LAW [Online]. Saudi Arabia General Investment Authority. Available: www.sagia.gov.sa [Accessed 4-3-2015]. UNESCO. 2010. National Literacy Programme (NLP) Country Profile: Pakistan [Online]. Available: http://www.unesco.org/uil/litbase/?menu =14&programme=66 [Accessed 2-3-2015]. World Bank. 2016. Annual Remittances Data. Global annual remittance information updated as at October 2016. Available: https://www. worldbank.org/en/topic/migrationremittancesdiasporaissues/brief/migration-remittances-data [Accessed 18-3-2017]. Murphy, C. 2012. Saudi Arabia’s Youth and the Kingdom’s Future, Woodrow Wilson International Center for Scholars, Middle East Program.